On the occasion of Doctor’s Day, Medical Superintendent, Jaipuria Medical Hospital, Dr. Rekha Singh was felicitated at Birla Auditorium in Jaipur for the excellent services rendered by her towards the management of hospital. 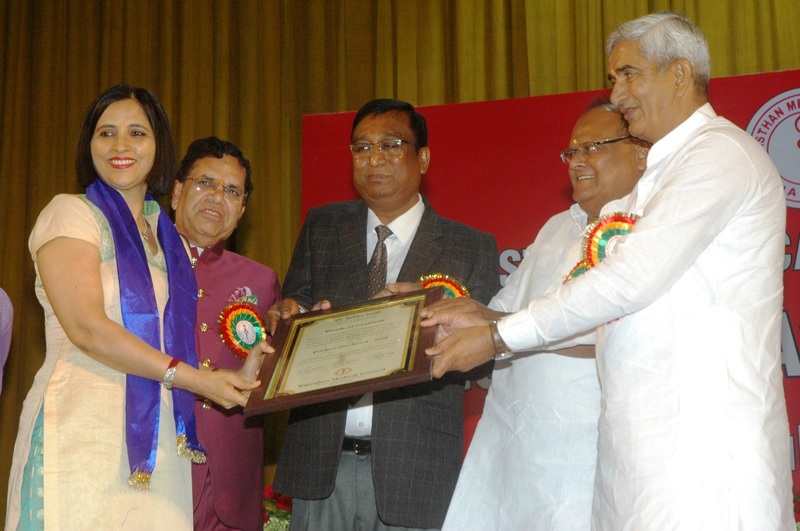 The award ceremony was organized by the Rajasthan Medical Council (RMC). Dr. Singh was given away the award in the category of ‘Excellence in the field of Hospital Management’ by the Medical and Health Minister, Government of Rajasthan, Mr. Kali Charan Saraf and Minister of State for Medical and Health, Mr. Banshidhar Bajya. Also present on the occasion were Registrar RMC, Dr. Jagdish Modi and Org. Chairman, Dr. S S Agarwal. On the occasion Dr. Rekha Singh said that it is indeed an honour to receive the award. It is the result of hard work, dedication and guidance of her seniors. Such awards encourage us to work even better towards the betterment of the society. During the ceremony, as many as 105 doctors were felicitated in the categories of ‘Young Medical Achievers Award, Exemplary work by senior Doctors, Medical Leadership Awards, among others. Some of the other doctors awarded on the occasion included Dr. Ajay Kapoor, Dr. Anil Kumar Jain, Dr. Ashok Kumar Chaudhary and Dr. D.S. Meena.